With Father's Day edging up, graduations occurring left and right, and the long days of summer upon us, my mind is alternating between thinking about gifts and outdoor activities. But what does Dad/Husband want? And what products are out there that will truly make summer travel or spending time out in the sun's rays even more enjoyable? Fortunately, the answers to those questions (and more) are conveniently found in the high quality technology available at RadioShack. · Get to your destination, near or far, without getting lost with the help of the Garmin nüvi GPS Receiver, as this voice-prompted, turn-by-turn gadget speaks to you until your arrival. The device includes lifetime maps and traffic and features a touchscreen interface, a slim, portable design, a trip computer to track your mileage and speed, and much more. 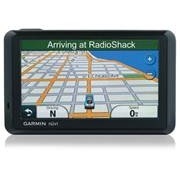 RadioShack carries multiple models of Garmin nüvi, all at affordable prices — it really is a must-have for your next vacation, whether by car or to find your way around a new location! · You won't put a damper on the drive by getting a ticket thanks to the Whistler XTR-130 Radar/Laser Detector. Instead of the unknown, you'll know what's ahead and be able to avoid getting pulled over with the 360° protection that this gadget can provide. · With the Olympus Tracker 10-30x25mm Zoom PC I Binoculars, you'll be able to show your family the amazing view, the bluebird in the tree or the deer walking through the forest. These powerful lenses, which reduce glare to provide outstanding clear powerful images, even protect your eyes from UV rays. Bring these along to the ballpark, on vacation or wherever you want to get a closer view! · Looking like a storm is about to roll in? The RadioShack 7-Channel Handheld Weather Radio with SAME can keep you prepared during emergencies, travel advisories, Amber Alerts and more. You'll receive current conditions, severe-weather warnings and more with this 7-channel radio, so you can be a hero and keep your family safe and dry. 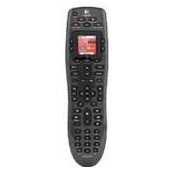 · Help Dad coordinate the man cave by gifting him the Logitech Harmony 700 Rechargeable Universal Remote. This device replaces up to six traditional remotes and lasts up to a week on a charge. The color screen and one-click activity buttons make the Harmony 700 a breeze to use, and the way that Logitech constantly updates their databases ensures that Dad can control his old VCR or his new Blu-ray player with the push of a button. · After a long day of work, doesn't Dad deserve to plop down on the couch and enjoy a moment or two of peace? The perfect way to do so is by choosing from over one million books, newspapers and magazines available to him right on the Amazon Kindle 6" Wi-Fi eReader with Special Offers. 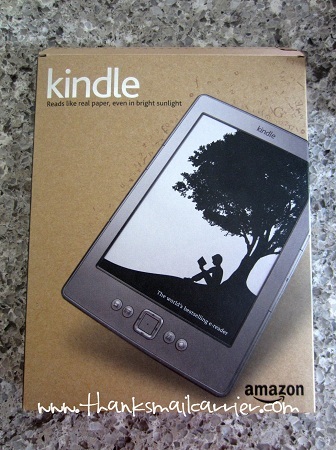 As my husband is always trying to find time to read the newspaper or his magazines, I knew right away that an Amazon Kindle would be a perfect gift for him. Plus, the next time we go on vacation we wouldn't have to use valuable suitcase space by bringing along a handful of books! 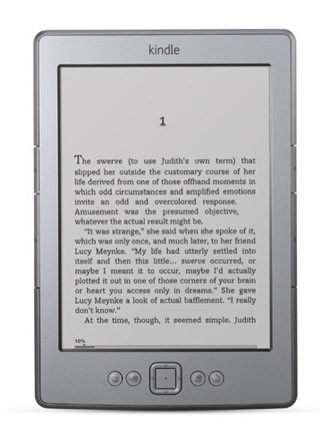 While I've used a variety of other devices, using the Kindle was my first time trying out an ebook reader. Right away I was amazed at just how small it is (6.5 x 4.5") and that it is actually thinner than my phone. 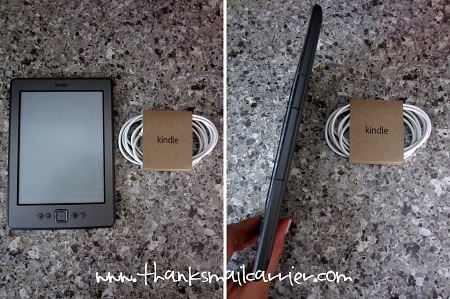 Along with the petite dimensions, the Kindle weighs only 6 ounces, so it can easily be held with one hand for an extended period of time... not to mention tucked into a very small purse to be transported just about anywhere. I like the simple, grey design, the rounded corners, and the very slight rubbery feel to the back. 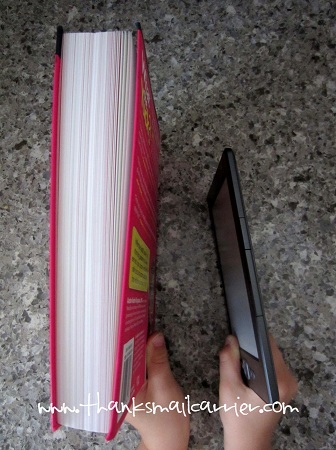 In all, the Kindle just feels good (and so much easier than a book) to hold! 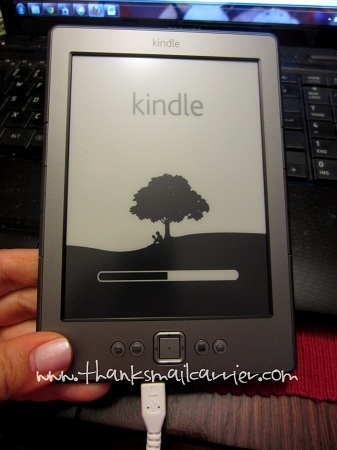 Even though I was a Kindle newbie, getting started using this device was intuitive and easy. While it doesn't come with a designated charger, it does include a micro USB cable — of which I have others lying around. I love knowing that there isn't one specific charger to keep track of for this gadget so I don't have to worry about losing it! However, thanks to the capacity of the Kindle battery, it can actually last a full month on a single charge, so there is no need to worry about going on vacation or taking a car ride and running out of juice. After plugging the Kindle into my computer, it only took a few minutes until I was ready to read. The Amazon Kindle is Wi-Fi only (other versions have 3G), and it had no problem detecting and connecting to our current wireless system. Once I had the Kindle registered and connected to my Amazon account, I was ready to experience the power of ebook reading. I was impressed right away with the crystal clear display of the screen and the way that the words quickly flicker and redraw themselves when I "turn" the page with the click of a button (I really appreciated that the page buttons are on both sides of the Kindle so that it can be utilized in your left or right hand). While I had heard that the screen was just as perfectly legible in direct sunshine as it was indoors, I was skeptical that there really wouldn't be any glare. However, it only took one time relaxing on our porch swing to discover that the Kindle really is perfect for reading at the beach, on a boat, in your backyard and more. On the flip side, the Kindle is not backlit, so it is necessary to turn on a lamp for reading in bed at night. Inside the Amazon Kindle, there are 2GB of memory, which in turns means it will hold somewhere around 1,400 books (there are no audio features on this Kindle Keyboard, so that means no MP3 player or audiobooks). Downloading proved to be extremely quick and easy — whether through the Amazon store right from the device or through my computer and the USB cable. When it comes to reading, the Kindle is simple in that it only has five main buttons, but it still provides a high quality experience. You're able to customize the text display — change font size, typeface, line spacing, number of words per line and orientation of the content on the screen — as well as zoom in on an image for a closer look. Yes, I like looking at recipes! At the same time, it is easy to "interact" with your documents by instantly viewing word definitions (the Kindle contains two different dictionaries) or searching for specific content. Highlight your favorite passages, add notes, create bookmarks... you can even connect to your social networks so that you can share your notes and highlights with your friends on places like Twitter and Facebook! I love that, along with books, you can display several types of files (e.g. PDF and TXT documents) on the Kindle so that if you have to put away 50 Shades of Grey and read documents for work instead, it's easy to do so. But when it comes to reading ebooks, I've been amazed at the large number available and how easy it is to have them at your fingertips in moments. When I don't feel like making a purchase, I have found that I can actually check ebooks out from my local library (free!) or even loan eligible books back and forth with friends who have their own Kindle or use a Kindle application on another supported device. An aspect of the Kindle that I hadn't previously realized was its ability to share your collection of ebooks between all of your devices that have the Kindle app. You can read a chapter of your book on your iPhone, the next chapter on your iPad, the next on your Android device, then on your PC... and each time you will be able to pick up right where you left off. You'll always have your books with you, no matter if the Kindle itself is at home or in your bag! All in all, it hasn't been hard to see why the Amazon Kindle is the top selling ebook reader. The screen reads like real paper, the longer battery life and large library ensure that you can read what you want, when you want, and the small, lightweight size is perfect for at home or on-the-go. While the lack of a keyboard has taken some getting used to (nearly every other device I own has a touchscreen, so I keep poking my finger onto the Kindle! ), once it is set up, the only typing that would be done is in the Kindle Store. As the icing on the cake (or the e-cake, in this case), RadioShack offers the Amazon Kindle at the eye-catching price of $79.99. 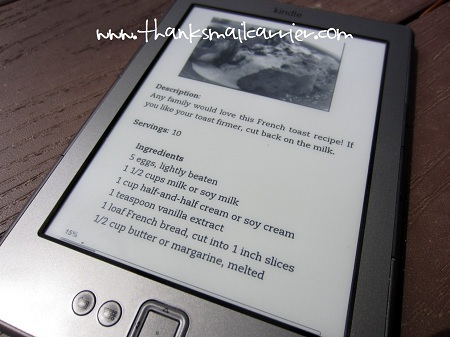 How amazingly cheap for a dedicated e-reader that looks and performs as though it costs much more! For a device with more features, RadioShack does also offer other versions of the Amazon Kindle as well as other brands of e-readers as well. For Father's Day, graduation or upcoming summer plans, RadioShack has the technology to make life easier and to thrill your lucky recipient. Be sure to visit them in store, on their website, and connect with them on Twitter and Facebook. I've heard great things about the Kindle! :) Wonderful review! 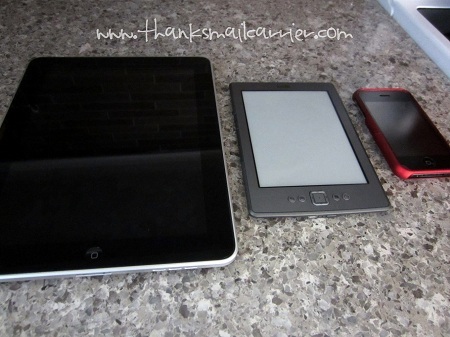 My husband and I both have Kindles and love them! I love my Kindle. I subcribe to an email that sends me daily free book links. great review. Been wanting one for a long time! Great features too.